Catherine Hearding is a self-taught artist with more than 40 years of experience in watercolor. She works from her home studio in Lake Elmo, where she can observe the rural landscapes that she loves to paint. Catherine maintains a full schedule of teaching and workshops with classes at White Bear Center for the Arts and Minnetonka Center for the Arts in the Twin Cities. Her classes include basic watercolor technique, landscapes, still life, composition and color theory. “My inspiration is most often found in the natural world, not necessarily in the sweeping landscape vista, but more often in the subtle color, light and form of things seen close at hand.” She wants her viewers to share her fascination with shadows and light and find excitement in viewing ordinary objects in beautiful light. Watercolor has become her favorite medium because of its unique ability to capture the essence of light. 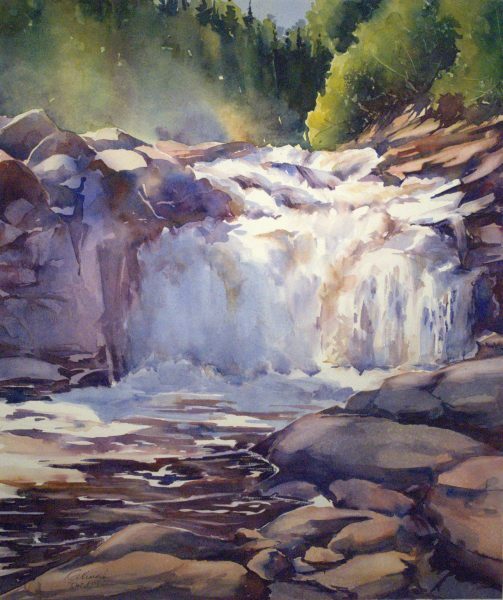 Catherine is a past president of the Minnesota Watercolor Society, and holds signature status in the Watercolor USA Honor Society, Minnesota Watercolor Society, Missouri Watercolor Society, Louisiana Watercolor Society and Red River Watercolor Society. She has received many local and national awards including recently: Adirondack National Exhibition of American Watercolors (Trails and Streams Medallion), Watercolor USA (Museum purchase award), Minnesota Watercolor Society (Best of Show 2014, 2015) and Minnesota State Fair Fine Arts Exhibition (1st Place 2014). Her work has been published in Northlight Book’s “Splash 14” and “Splash 16” watercolor books. Her work is found in public collections including the Springfield Art Museum (MO), Children’s Hospital (Mpls), Hudson Hospital (WI), Stillwater Medical Group (MN) and in numerous private collections.